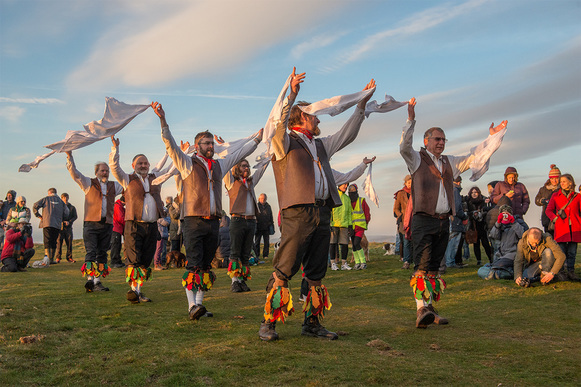 Page-header: Lassington Oak Morris dancers at sunrise, May Day 2016, on May Hill, Glos © Eden Tanner, 2016. Eden provides photos for FQ. ⊕ Available with a dance caller, and sometimes as a 4 piece, please call or e-mail to discuss the options. Irish and Scottish tunes. From gentle harmonies to driving rhythms. ⇒ 32 Cudnall Street, Charlton Kings, Cheltenham, Glos GL53 8HQ. ⊕ Dynamic dulcimer, bouncing banjo, furious fiddle, and percussive piano - English rhythym with attitude! ⇒ Cudnall Street, Charlton Kings, Cheltenham, Glos GL53 8HQ. ⊕ Judith van Dijkhuizen piano, dulcimer, & recorder; Dave Anderson fiddle & soprano sax; Mick Holditch guitar; & Chris Beaumont melodeon. ⊕ The band that bump-started the English ceilidh scene. Fiddles, brass, piano and percussion. Classic. → Every Tuesday from 7.45 p.m. at Chosen Hill School, Churchdown, Glos. ⊕ Based in Highnam, we are Gloucester’s resident Morris Team, and perform a wide variety of traditional Cotswold Morris Dances. → Thursday. Earls Croome Village Hall, near Upton-on-Severn. 8pm to 10pm. 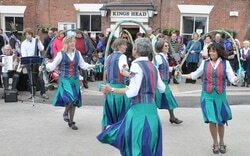 Weekly during winter, dancing in summer at pubs, festivals & other venues. → Every Wednesday at The Talbot, Knightwick (A44, 7 miles from Worcester). ⊕ Cotswold Morris. New members (experienced or beginners) welcome.